Rachael Wolters grew up on a farm in northern Idaho and as she got older, Wolters began to consider pursuing agriculture, specifically animal science for her future career. 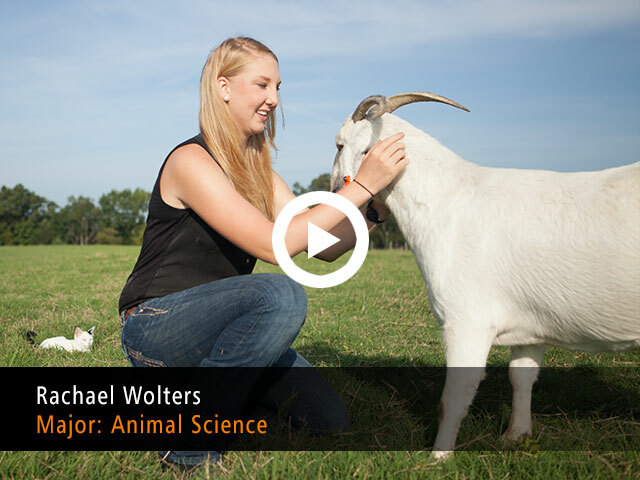 For Wolters, the choice was obvious, and ultimately, she wants to be a livestock veterinarian. Wolters jokes that during finals week, she enjoys squeezing in time to work at the Sheep and Goat Center to help her relax between exams. Wolters is a stand-out student on her own as she continues to be involved in the College of Agriculture and Applied Sciences. “UT Martin has a lot of opportunities for students to compete in things in our specific interest groups,” Wolters said. “This last year, I competed in the UT Martin Farm Bureau Agriculture Issues Discussion Meet." Both Wolters and fellow UTM student, Rachel Ralston, competed in the state competition this summer at the Young Farmers and Ranchers Conference. Wolters has also obtained a coveted spot as a McWherter Innovator in the Ned Ray McWherter Institute (NRMI) for Collaboration and Innovation. The NRMI is a three-year, progressive, interdisciplinary program customized to the individual student. At capacity, 30 student participants, six from each of the five Colleges at UTM, will be active in the program. Each student participant will be paired with a personal mentor from their desired industry who will guide the student as they progress and reinforce the programming of the Institute while connecting them to the world outside of the University. Wolters said, "It's going to really be something that is setting me apart as I start applying to vet school, applying to programs, jobs and internships. It's something that I'm new in right now, but something that I'm super excited about."